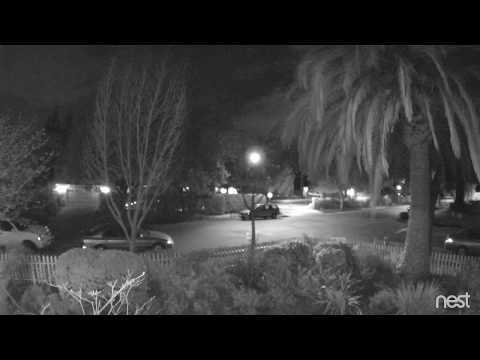 Top: Surveillance video footage shows a person or persons stealing and/or damaging a sign opposing Castilleja School's expansion from residential properties near the campus. Videos courtesy of Nelson Ng. Bottom: Signs of residents who oppose Castilleja School's expansion are among those being damaged or stolen over the contentious proposal to redevelop the campus and expand its enrollment. Photo courtesy of Nelson Ng. In the battle over expanding the private all-girls Castilleja School, lawn signs have become perhaps the most visible manifestation of the discord between the school, its supporters and some of its neighbors in the past couple of years, with both sides waging aggressive campaigns to garner support for and against the school's proposed redevelopment. But in a sign of how seriously people are taking the issue, some have allegedly vandalized and stolen the lawn signs of the otherside. The problem became acute enough that Castilleja filed for a temporary restraining order against a Palo Alto man who opposes the expansion, claiming that he is responsible for the repeated theft of and damage to the school's pro-Castilleja signs. School leaders filed a 38-page request for the restraining order against neighbor James Poppy, 64, which was signed by Head of School Nanci Kauffman on Feb. 1 and filed in Santa Clara County Superior Court on Feb. 7. The court approved the temporary restraining order, which will be in place until a hearing on Feb. 26. In its court petition, Castilleja wrote that it has video evidence and witnesses to show that Poppy engaged in repeated vandalism or removal of signs, including at Kauffman's home. Poppy told the Weekly that he did remove five signs at one time and admitted the incident to police, but he maintained that he is not responsible for the other acts of vandalism. Castilleja's petition asks the court to require Poppy to stay at least 50 yards away from the school, located at 1310 Bryant St., as well as from Kauffman and Associate Head of School Kathy Layendecker, and more generally from people who are known to him to be Castilleja students, employees or supporters. He would be barred from directly or indirectly contacting any of the protected persons, including by phone, in writing or by any electronic means, and disturbing the peace of the persons or destroying any personal property. He would also be banned from stalking, threatening, intimidating or assaulting any of the people in the order. The court filing also asks that Poppy reimburse the petitioners for nearly $5,500 in legal costs and filing fees. Castilleja repeatedly reported the vandalism to police, the petition states. The alleged thefts and defacing began on Sept. 12, 2017, when a school banner hanging over the Embarcadero Road overpass was stolen and several signs were vandalized with a sticker stating "Stop the Lies -- Nanci K and Kathy L: Stop Lying to City Hall. What are you teaching students? Get what you want no matter the cost or impact to others?" School security cameras showed a silhouette of a man walking the perimeter of the campus with a sheet of paper believed to be the "Stop the Lies" stickers. In October 2017, eight red cyclamen plants that formed a letter "C" for Castilleja were pulled out of the ground and tossed over a hedge and a Castilleja yard sign was stolen. Three more incidents occurred in March 2018, captured on surveillance videos and witnessed by a school maintenance worker. After the worker called Palo Alto police, Poppy was cited for petty theft. In a police report dated April 1, 2018, Poppy admitted to stealing the signs from the school property. "I made a bad judgment," he told an officer, the report noted. Castilleja's attorneys then sent Poppy a cease-and-desist letter in May of that year demanding that he not steal or vandalize the Castilleja signs, trespass on school property or misuse the school's logo. Poppy agreed in writing not to continue the behaviors, according to the petition. In December 2018 and January 2019, additional vandalism took place, including an incident in which someone used stickers to change "We Support Castilleja" signs into "We Support White Privilege" signs. The school then requested the restraining order. When reached by phone, Poppy denied that he is responsible for any vandalism that occurred after a March 31, 2018 incident. "I fessed up to my one incident. I'm sorry about the bad judgment. But I didn't do any of this. I wanted to do this amicably. I thought about hiring a lawyer, but we're talking about lawn signs," he said. "Restraining orders are usually for domestic violence or something like that," he added. Poppy said he would stay the 50 feet away from Kauffman and Layendecker. "I would gladly do that if I knew what Kathy Layendecker looks like," he said. Some neighbors, including Poppy, are opposed to the school's proposed redevelopment, saying they have been negatively impacted for 15 years since the school began enrolling more students than they were legally allowed to. In addition to new development, Castilleja is asking the city to allow it to increase its student body by 30 percent above its current permitted enrollment. Poppy said he thinks the school is using him to make students believe that opposition to the school's expansion boils down to one person. Castilleja spokeswoman Lorraine Brown said the school's attorney has told them not to comment on the case. But school neighbor Nelson Ng said that residents who oppose the school's expansion have also had their signs targeted by vandals and thieves. They have logged at least 50 incidents of sign theft and damage in the past couple of years. They have since stopped counting. He has video from his home surveillance camera in 2017 and 2018 of such incidents. On Aug. 16, 2017, a man running down the street during daylight can be seen swerving off the sidewalk and swatting a sign flat onto the ground on an adjacent property. On March 18, 2017, a man jogging on the opposite side of the street at night crossed over and ripped a sign out of Ng's yard, throwing it down into the gutter. On April 8, 2017, also at night, a man jogging on the opposite side of the street looked both ways, crossed the street and ripped the sign out of Ng's front yard, then ran across the street and down the block carrying the sign. A man walked up at night on July 20, 2017 to Ng's gate and stole a sign, carrying it away. Ng reported the incidents twice to police, he said. Ng also has photographs of multiple signs that were torn or cut up and discarded at various locations in the neighborhood surrounding the school. He is opposed to the vandalism, he said. "I truly believe in freedom of speech. The signs are a way for the neighbors and Palo Alto residents to voice concerns about Castilleja's expansion plan and violation of the existing conditional use permit," Ng said in an email on Friday. "But at the end of the day, the signs are not the issue. The true issue is the impact to the neighborhood by Castilleja's expansion. In the last couple of years, the school's stubbornness to push forward with a plan having significant impact to our quality of life impact has taken a major toll on our mental well-being," he said. Editor's note: A previous version of this story stated that Castilleja has asked to increase its enrollment through a variance. The school wants to increase its enrollment through the conditional-use permit.